Low competency in animal research – A bitter truth? The advancing trends in international medical and pharmaceutical research are imposing intense responsibilities over the modern scientific researchers. Although, it’s a healthy challenge, developing the research proficiency or meeting the financial needs to execute high-edge researches, in a short-span is practically impossible in the developing countries like India. CogniBrain is an affirmative biomedical research land which offers a network-based end-to-end preclinical research services – as an economic and trustworthy animal testing lab/ in vitro lab. Are medical experiments conducted on plants and animals a bane? Never! But, your study design must be rational enough to bank on every animal in your preclinical studies or you could take our power hands for the ethical reasoning and genuine research on in-vivo testing or drug screening. Advanced animal studies? Don’t strain your brain, you have CogniBrain! The sphere of animal research is expanding and advancing day-by-day. To set your research career to the tune of the scientific advancements, CogniBrain’s preclinical research services is a one-stop-shop for all your research needs. 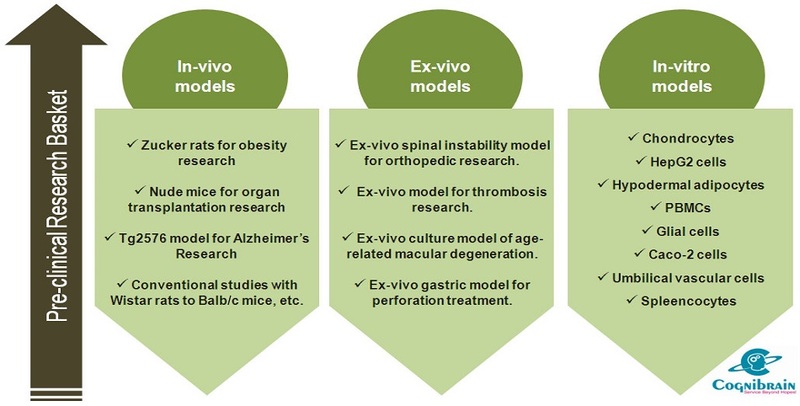 We aid you carry out advanced researches using conventional/ transgenic animal models, ex-vivo and in-vitro models. What other research studies we perform?